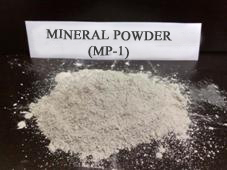 Mineral dust is a kind of dust or powder received from the drying and grinding result of carbon sedimentary rocks of chemical nature (compact lime-stone, oolitic lime-stone, calcareous tuff, singer lime-stone, dolomit, marlstone). Production of dry construction mixtures. Raw material supply is effected from open storage into the raw material hopper of volume up to 15м3. Flow density is regulated by the parallel-slide valve. Material is dozing by a belt feeder and supplied by belt conveyor into the loading chamber of a drying cylinder. Drying drum cylindrical body (diameter 1,6m. length 10 m. for complex STROM-MIN-15) is a welding structure from steel plate of thinness 10mm., steel grade 09Г2С (09G2S) made from separate sidewalls. Drum volume 20,1m3, is installed inclined 10-40 to horizon adjusted, by rotation frequency. For heat transfer activation the heads are installed inside the casing: in the very beginning - screw type, in the middle part - lifting-blade and sector type. Casing support is two steel tyres. One tyre is beveled for thrust rollers that prevent from the longitude drum shift. Ring gear is fixed on the drum casing by means of cross-beams, through which the drum is rotating from the drive. The drive consists of drive pinion, gear box and electric motor of power– up to 18,5kW; rotation frequency 1500 rpm, connected between each other by couplings and mounted on one frame. Fuel combustion occurs in heat generator by means of a gas burner. Hot furnace gases enter the casing and touching the material heat it up evaporating the moisture it contains. Temperature of the heat carrier supplied to the drum shall not exceed 900оС. On outlet: raw material moisture not more than 1%, temperature not less than 100-150оС, to exclude possibility of moisture condensation in the drum unloading part. Raw material going through the drum is getting dry and through belt feeder with thermal-resistant belt enters the ELM elevator that is designed for vertical transportation of raw material into the measuring hoppers of ball mills. Application of elevators as an interstorey transport vehicle enables having compact transportation schemes taking small area. Outgoing furnace gases undergo two cleaning stages (cyclones and sleeve filter). The first step: dust-air mixture by means of vacuum created by the exhauster is carried out from the unloading chamber of the drying cylinder and is supplied to cyclone wherein the primary treatment of furnace gases occurs. Use of cyclones at the first stage provides reduction of dust load. It also enables to increase the service life of filter elements and guarantee minimum emissions into the atmosphere. Second step: after cyclone the air-dust mixture containing the mineral dust is headed for fine processing into the sleeve filter SFR. Dust laden gases due to vacuum created by the fan enter the dust laden chamber through collectors and going through the sleeve filters are discharged dedusted into the atmosphere and dust – finished mineral dust is deposited on the outer sleeve filters surface. 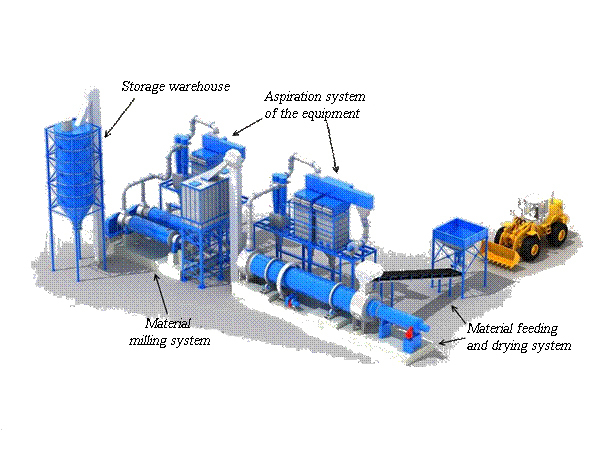 Finished mineral dust trapped in the cyclones and filters is fed by transportation equipment system to finished product storage. Raw material dried and treated from dust air mixture enters the feed double hopper of dry material. The hopper of volume 20m3 with split outlet and two parallel-slide valves of manual drive are designed for temperature decrease of dried raw material from 1500С to 600С, as well as for moisture protection and material distribution prior to grinding. After hopper the raw material by belt feeders is supplied to the loading chute of ball mill 1456А. The mill drum is a steel hollow cylinder welded from the steel plate of thickness 14mm, with inside linings and cast lining covers. The drum is closed from both sides by end walls – loading and unloading. Covers are cast together with hollow trunnions. Support tyres are set on the trunnions by which the drum is leaned on two carrying rollers. Mill is driven from the electric motor with power 132 kW, rotation frequency 730 rpm, through coupling, gear box with gear ratio 25 and a flexible coupling. The mill drum is split by intermediate partition into two chambers: preliminary and fine grinding. Preliminary grinding chamber is loaded with balls; the raw material is supplied to this chamber after the loading chute by loading screw with lead bars. While rotation the balls do the primary grinding. Then the material enters the fine grinding chamber which is loaded with grinding cylinders (cylpebs). By means of small diameter of cylinders the material contacting area is increased that enables to reach the required fineness of finished product. The material shift creates pressure of continuously supplied raw material. After the fine grinding chamber the mineral dust by screw with lead bars enters the unloading drum with screen intended for separation of accidentally passed coarse fractions. Ball mills are aspirated with the purpose of dust removal elimination from the mill casing into the atmosphere as well as for intensification of grinding process by means of smaller particles removal from the mill casing that create dust pad decreasing the material attrition effect by the balls and mill lining. Finished mineral dust being trapped in the cyclones and filters is supplied to ELG elevator together with the dust from the mills with screw conveyor. The elevator transports the finished product to storage depot – storage tank. The storage tanks are equipped with aeration, aspiration system, filling level control and unloading system into transport. * Line characteristics to be clarified in each specific case basing on raw material features and the requirements to finished product.